President A. Gabriel Esteban took the stage at the Holtschneider Preformance Center to deliver a 45-minute state of the university address to faculty and staff on Thursday Oct. 4. Correction: In the print version of this story, The DePaulia misattributed the photo credit. The photo was taken by Laycie Dressler. 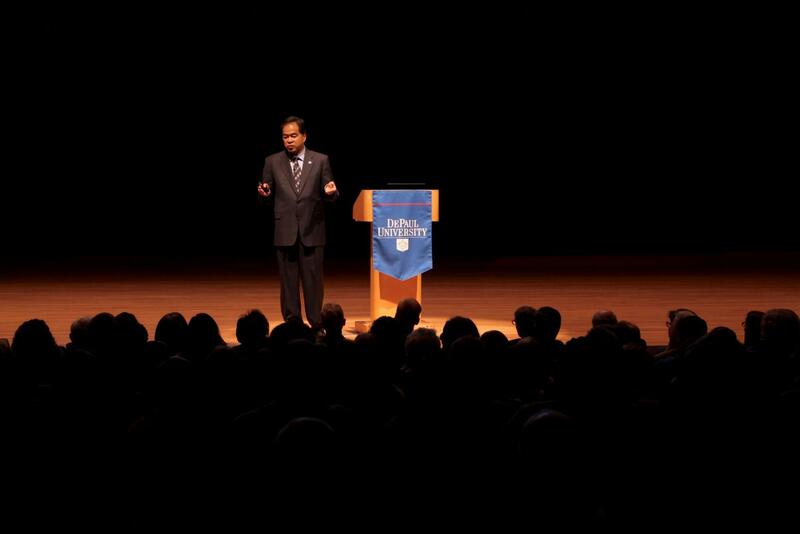 President A. Gabriel Esteban addressed faculty and staff at the second State of the University address in DePaul’s history on Thursday, Oct. 4. Faculty and staff packed into the new Holtschneider Performance Center to hear Esteban’s 45-minute speech, laughing at his jokes and nodding their heads in support of the new initiatives that were presented. In his speech, Esteban touched on budget cuts and enrollment numbers, as well as new initiatives that the university plans to take in order to accomplish the goals set forth in the 2024 strategic plan. While talking about the financial update for the 2018 fiscal year, Esteban mentioned the layoffs that occurred over the summer, saying the layoffs provided the university with “flexibility” within the new budget. Throughout his presentation, Esteban showed faculty and staff promising numbers for the year’s budget. There was a 2 percent growth in total revenue and no growth or decline in expenditures, according to the university’s reports. Esteban talked about DePaul’s goal to invest more into the future, which included making tuition more affordable through “modest increases” in tuition and providing more student aid, working to give faculty and staff a more competitive salary, starting new programs and curriculums, expanding facilities and increasing endowments. Esteban also said the university plans to invest in more branding ads, three out-of-state recruiters, increasing financial aid and raising salaries with the new year’s budget. Enrollment saw a one percent decline in 2018, which Esteban said was better than the original projected numbers. The current freshmen class was ranked as the second largest in the university’s history, and now constitutes 27 percent of the total enrollment at DePaul. Creating a more diverse student body, faculty and staff has been a major push for Esteban since he joined DePaul. The president announced new initiatives to promote diversity in his strategic plan, including a new faculty fellowship, a diversity advisory committee, and a program that centers on minority and women-owned businesses. Student retention rates are a constant concern for DePaul, especially since the university tends to be a tuition- dependent institution. Esteban said it is a key issue for the administration to look at ways to solve the retetention rates in the upcoming years and in order to keep budget cuts at bay. The school is planning to expand the peer mentoring programs such as the Chicago Quarter Mentor program, where an upperclassman helps new students become acclimated to DePaul, and turning it into a year- long initiative that aims to help first year students properly acclimate to the university. The Career Center will also start developing an outlook for helping students find internships and careers that may be outside of their major but fit their interests more. Esteban also said that a major focus over the next six years would be funding academic growth and innovation projects. After a number of applications were filed, the university has chosen eight new unnamed academic programs to begin funding throughout different departments. DePaul has also started to look ahead at future endeavors and creating plans to expand not only academically but socially, according to Esteban. Tasks forces have been formed that focus on building student engagement and expanding on student’s school spirit at DePaul and exploring the possibility of changing the current quarter system that DePaul is on to the more traditional semester system. Esteban said it has been brought to his attention that the quarter system has caused for students to miss internship and job opportunities because of the June release dates from the quarter system. However, the switch from a quarter to semester system is still years ahead. “[Our tasks forces are] about looking at where DePaul will be at in 2040,” Esteban said.